An updated news source for events on and off campus. Run and managed by St. Olaf students with the Hong Kierkegaard Library. A senior research fellow of the Hong Kierkegaard Library, Jamie Lorentzen will lead the Julia Watkins Lecture this Fall on the topic Crashing into One’s Self: Decisive Encounters with the Wisdom of Kierkegaard & the Value of First Person Responses. Attend for an enlightening evening of Kierkegaardian conversations! The Lecture will start at 7 pm in St. Olaf’s Viking Theater. The Casual Kierkegaard Conversations return! Students with an interest in Kierkegaard are encouraged to attend this spooktacular close reading of Kierkegaard’s At a Graveside this Thursday from 11:30 – 12:30 pm in the Library lounge. No prior knowledge required. Snacks will be provided! The Hong Kierkegaard Library is hosting a Thursday night pizza event for all St. Olaf students interested in philosophy. Over several boxes of pizza, students will have the opportunity to discuss world matters and philisophical affairs. Discover your “why?” with Jennings! “Why am I here?” is one of the biggest questions we can ask. On September 20th at 7 pm in CAD 305, Antonio Jennings will speak on the importance of service and how to serve within your passion to get to your “why? This Ole Alumn lives to inspire others to exceed their own expectations. 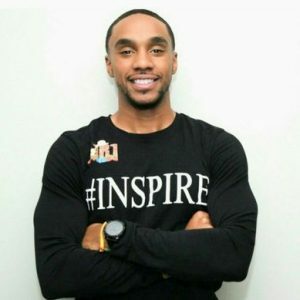 Antonio Jennings is the founder of the Each1Reach1 foundation and works as a motivational speaker, minister, community activist, and author. For more information, visit Antonio Jennings’ official webpage. 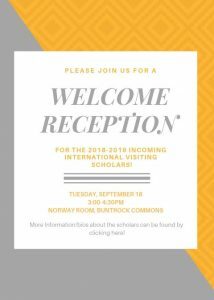 Tuesday, September 18th held an afternoon reception of engaging conversation and delightful company with the 2018-2019 International Visiting Scholars in the Norway Room in Buntrock Commons! For more information on the Visiting Scholar’s program and participants, view the official International Visiting Scholars webpage on the Hong Kierkegaard Library website. St. Olaf College challenges students to excel in the liberal arts, examine faith and values, and explore meaningful vocation in an inclusive, globally engaged community nourished by Lutheran tradition. We wish you well with all of your academic endeavors! The sun disappears beneath the horizon line, enshrouding the St. Olaf Hill in darkness, marking an end and a beginning. For some, in the quaint town of Northfield, it is merely the end of a seemingly-ordinary Friday; for others, however, it is the end of a summer full of research, friendship, and growth. Since the beginning of June of this year, scholars from across the globe have traveled numerous miles to join a vibrant, intellectual, and caring community of Kierkegaard Scholars. 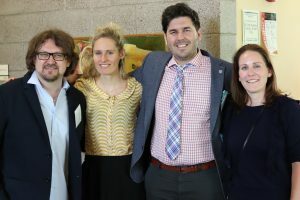 Whether they are here simply for the 8th International Kierkegaard Conference or for the entirety of the summer, our scholars have found a home away from home, a community otherwise obscured in the wake of all other academia. The summer started off with the International Kierkegaard Conference where both renowned and aspiring scholars shared papers on the topic, “The Wisdom of Kierkegaard: What Existential Lessons have you Learned from Him?” After the five-day conference came to an end, the 150 scholars dropped to a smaller number, a little over 50, 13 of which were Young Scholars. While the remaining Kierkegaardians conducted their research over the remainder of the summer, the Young Kierkegaard Scholars program was a two-week series of seminars that allowed for undergraduate students from across the nation to research with Professor Marino and either prepare for graduate school or buff-up their CV. In the midst of this commotion, every Tuesday and Thursday the Hong Kierkegaard Library hosted summer seminars in which the Summer Scholars were able to present and answer questions about their questions. Whether it was a part of their dissertation or an independent study, this provided a comfortable space for them to talk about their meaningful work. For example, one stupendous seminar lecture was given by the venerable Dr. Richard Purkarthofer who spoke about the Hong Kierkegaard Library Rare Book Room and the various book bindings of our pre-1856 collections. Overall, this was rather an eventful summer for the Library. There were many blissful highlights that we were able to share with our Kierkegaardian family: the opening dinner for the conference where College President David Anderson made the commencement speech, and the publication of Professor Marino’s new book, The Existentialist’s Survival Guide. As this fruitful summer comes to an end, we have been glad to create many memories with old and new friends alike. A video archive of past lectures given by scholars affiliated by the Hong Kierkegaard Library can be viewed below. Jamie Lorentzen is a Hong Kierkegaard Library Senior Research Fellow. Professor Vincent McCarthy is a Ph.D. (Stanford) professor of philosophy at St. Joseph’s University, having served there also as Provost and Dean of the College of Arts and Sciences. He is widely published in the fields of enlightenment philosophy, existentialism, and philosophy of religion. Utech seminar on Did Heidegger Plagarize Kierkegaard?